Note: This can also be made from minced turkey, lamb or beef. Wash minced chicken & squeeze out the water. Note: Make sure you have squeezed out all the water from the minced chicken else it might not stick to the skewers. Bread crumbs are used to absorb excess moisture. In a mixing bowl add minced chicken, chilly powder, ginger paste, garlic paste, coriander powder, garam masala, coriander, salt, egg, bread crumbs. Mix well. Preheat the oven at maximum temperature for 10 min. Brush oil to skewers/sheeks so the kabab doesn’t stick to it when cooked. Spread the mixture on the skewer/sheek, create a uniform shape around each skewer. Cover the oven safe tray with aluminum foil to reduce oil stains while cooking. Place the skewers on the tray & keep it in the oven. Note: Skewers ends should be kept on the sides of the tray so that there should be gap between tray base & the kababs. Cook it for 10min or until cooked. Once the kabab is cooked turn the skewers & cook the other side. When fully cooked remove it from the oven. Cut it into pieces & slowly pull the kababs from the skewer. 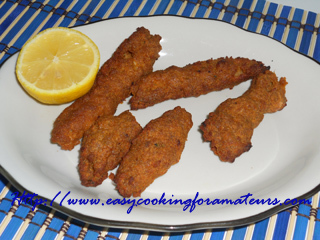 Sheek kababs are ready to serve hot with lemon wedges. Note: You can also grill this on barbeque grill, grill pan or shallow fry on griddle plate (tava). If you don’t have oven or skewer you can also deep fry it in the oil. 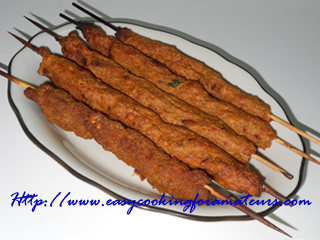 If available use a square skewers/sheeks so you can rotate and cook the kabab properly. wow..thats looks v inviting..n mouth waterin! Looks too good! Thanks for sharing dear.. This is my favourite, looks very yummy. Very inviting and truly tempting..
very nicely done..they look perfect!! very tempting kababs...looks super delicious. great blog with so many mouthwatering recipes...the sheekh looks incredibly good. These chicken kababs look delicious! wow! !looks so perfect and yummy!! Looks delicious. What a great recipe. Looks so tasty, yet so simple!